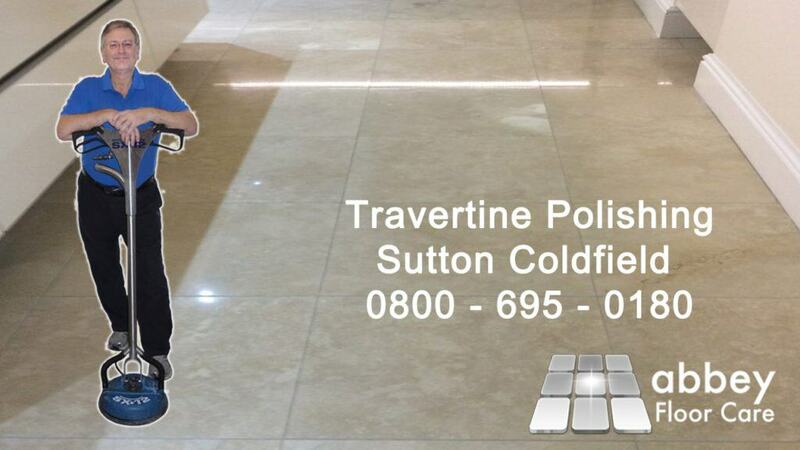 Hello there we are here in Sutton Coldfield Birmingham polishing a honed travertine floor. The floor was laid about 7 to eight years ago however it needs some tlc. Before we were called and the tilers had inexplicably put in black grout to match the stained grout on the tiles, Some tiles had been changed . For many years the floor has gradually worn away leaving holes and pits that have filled with grease and dirt. Acidic food and drink splatters have left behind spots on the tiles. The bottom of the door has marked the surface of the tiles, making deep scores. We began with a deep clean using cleaners, honing powders and chemicals. 800 grit honing powder was rough enough to work dirt out of the tiles tiles and grout lines without damaging the surface area of the tiles. When the floor had been been carefully rinsed we hard honed the floor starting at 200 grit, finishing at 1500 grit. The two-hundred grit honing did away with the majority of visible scratches and scuffs and the final fifteen hundred grit home gave the floor a soft sheen. We finished by polishing the floor with a marble powder. This gave the floor tiles with a stunning shine. We had to treat the scratched by the door with hand tools as the scratches were quite deep. We managed to get a charming surface without breaking through to any pits and spaces. The black grout lines were now very noticeable compared to the original cream grout. We coloured the black grout making it a light sand to look like the other clean grout. Finally we used 2 coats of high quality impregnating sealant. We carefully discussed the significance of looking after the floor correctly, utilizing the right cleaning chemicals and mops. Their floor will certainly continue to look gorgeous for years to come. If you considering having your travertine tile floor or any other type of natural stone floor bring back to a gorgeous finish call AbbeyFloorCare on 0800 695 0180 or complete our easy contact form .